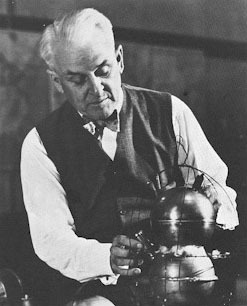 American physicist Robert A. Millikan studied in Europe under Walther Nernst and Max Planck, and first came to prominence with his elegant oil-drop experiments of 1909, in which he measured the electric charges on tiny falling water (and later oil) droplets. His study established that any particular droplet's electrical charge is a multiple of a definite, fundamental value — the electron's charge. Beginning in 1912, he spent several years investigating and finally proving Albert Einstein's proposed linear relationship between energy and frequency, and providing the first direct photoelectric support for Planck’s constant. In 1923 he was awarded the Nobel Prize for Physics. During World War I he served on the National Research Council (NRC), conducting emergency research into submarine detection. He was also a leading proponent of NRC fellowships, which have since provided grants to especially promising PhD graduates in scientific fields. In 1921 he relocated from the University of Chicago to the California Institute of Technology, where he served as professor and President and spent the remainder of his career studying cosmic rays (a term coined by Millikan).